On the left is a prototype--note there is no magazine safety lever and no metal plate on the back of the grip. 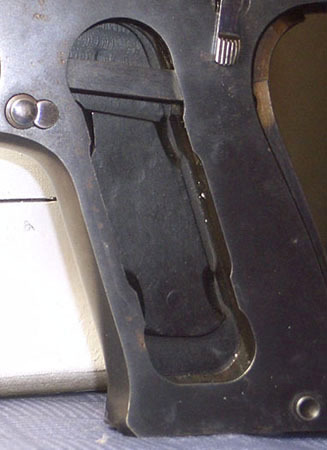 (We believe the grip shown with this prototype is a production hard rubber piece missing the metal plate and rivets--note that it has indents rather than overhangs.) 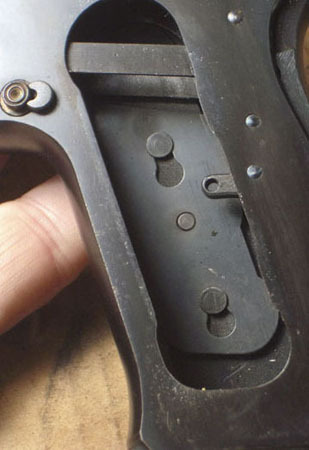 The original design was for the grip to be held on by dovetail grooves in the hard rubber. Pedersen actually patented this grip retention method. On the right is a production gun--you can clearly see the magazine safety lever and the metal plate on back of the grip. Grips made like this never fall off and rarely crack or break (I have occasionally seen a broken corner), though they are expensive to manufacture.